The leading independent exploration and production company is due to report on Thursday morning. ConocoPhillips could start to reverse this trend by reporting a solid second quarter, with three things, in particular, standing out ahead of that report. 1. Did the company hit its production target? Three factors drive ConocoPhillips' financial results: Oil prices, operating costs, and production. Of the three, production is the number to watch this quarter due in part to the impact of the wildfires in Canada. Because of those fires, the company and joint venture partner Total (NYSE:TOT) shut down their 60,000-barrel-a-day Surmont facility in early May and by mid-June the partners had only restarted 73% of the wells. While that production shutdown hurt, it could have been much worse if the facility sustained a direct hit, especially given that ConocoPhillips and Total just finished expanding Surmont's production to 170,000 barrels per day. Given that impact, investors should look to see if it caused ConocoPhillips to miss its production guidance of between 1.5 million to 1.54 million barrels of oil equivalent per day, or BOE/d. That said, what the market would love to see is that the company was able to remain on track despite the impact from the wildfires because the rest of its operations performed above expectations. 2. Were there any more updates on the deepwater exploration exit? In response to low oil prices, as well as the company's changing long-term view of the sector, ConocoPhillips is exiting its deepwater exploration program in phases. It took the first step earlier this month when it announced the sale of its Senegal assets to Australia's Woodside Petroleum. The company still has several assets left to sell. Topping the list are its huge acreage position in the Gulf of Mexico and its stake in an exploration joint venture in the Canadian Atlantic with Canadian oil sands leader Suncor Energy (NYSE:SU) and global oil giant Royal Dutch Shell (NYSE:RDS-A)(NYSE:RDS-B). Of those areas, the one to watch is the Canadian Atlantic. The partners are currently drilling two exploration wells, and if ConocoPhillips announces positive drilling results, it puts the company is a better position to capture a decent value when it puts the assets on the market. That is important because there are not a lot of prospective buyers given the location and the currently weak oil market. Suncor Energy, however, could be its best bet because it is specifically looking for acquisitions to bolster its position in the Canadian Atlantic. 3. Are there any more changes to the spending plan? When ConocoPhillips put out its initial 2016 operating plan in November, the capex budget was set at $7.7 billion, which just happened to match its plan for operating costs. However, in light of crashing crude prices to start the year, the company cut its capex budget to $6.4 billion in February while lowering its operating cost plan to $7 billion. A couple of months later the company made an additional cut to capex, reducing that to its present budget of $5.7 billion. Given that trend of falling costs, investors should see whether the company details any additional spending reductions. Operating expenses, in particular, bear watching after the company announced last week it was laying off 1,000 workers, equating to 6% of its total workforce. 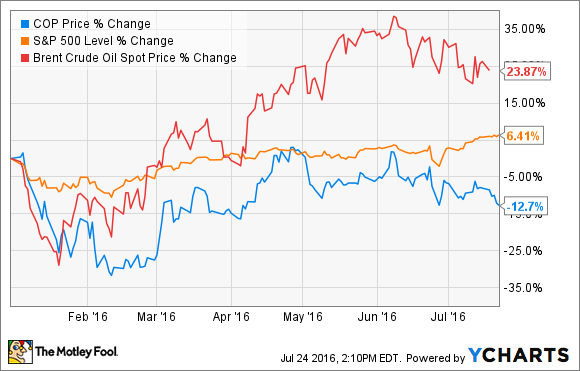 ConocoPhillips is slowly changing course to soften the impact of oil price volatility. The hope is that the company continued to make tangible progress during the second quarter. Its ability to do that will not only put it in a better position to withstand another deep drop in prices, but also to pivot quickly to capture the upside as prices improve.